Oh, my! What an interesting and colorful bug. What an interesting bug. How big is it? Your pages are so colourful and the lantern bug is amazing! I love al these 3 pages, so colourful and beautiful!!! The lantern bug is amazing, I'd love to see one. 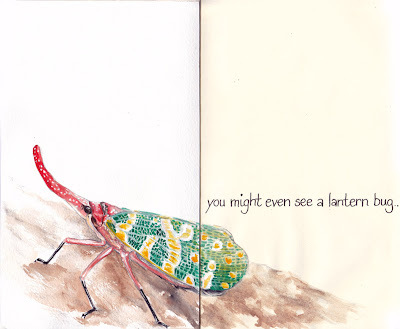 Your pages are so fabulous and I love how you led into the lantern bug from the paper lanterns! Every page of your sketchbook in this project is fantastic, Debra! Love your sketchbook project!Your idea about adding watercolor paper to the pages. I haven't joined the project because I dislike the paper so much but your idea has me thinking!